Striped Nails for the #31DC2018Weekly - Polish Etc. I am almost caught up! Today, I have my striped nails to share with you for Week 12 of my weekly version of the 31 Day Nail Art Challenge. 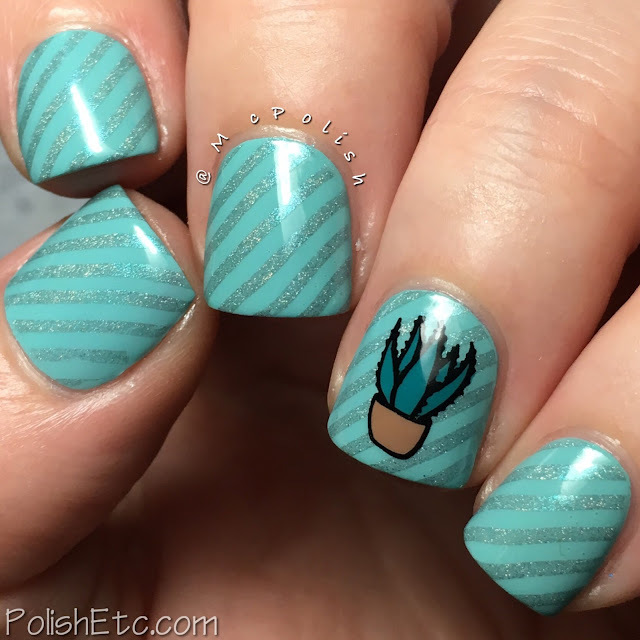 I chose of calming colors and a little image of a succulent for this mani. I have been obsessed with succulents over the past few years. I am a brown thumb but my mother can make any plant thrive. So, for Mother's Day this month, I got her a few succulents to start her rock garden off right. Hopefully, I can watch her grow these beauties now! My manicure today combines regular stamping with a little reverse stamping. I think it all ties in well together! I started off with a base of a minty cream, "For Audrey" by China Glaze. I stamped over it with AEngland's "Captive Goddess" using the Candy Plate from Color Club. This holographic blue/grey shade has a lovely aqua blue shifty shimmer. You can see it nicely in the stripes when the light hits it! 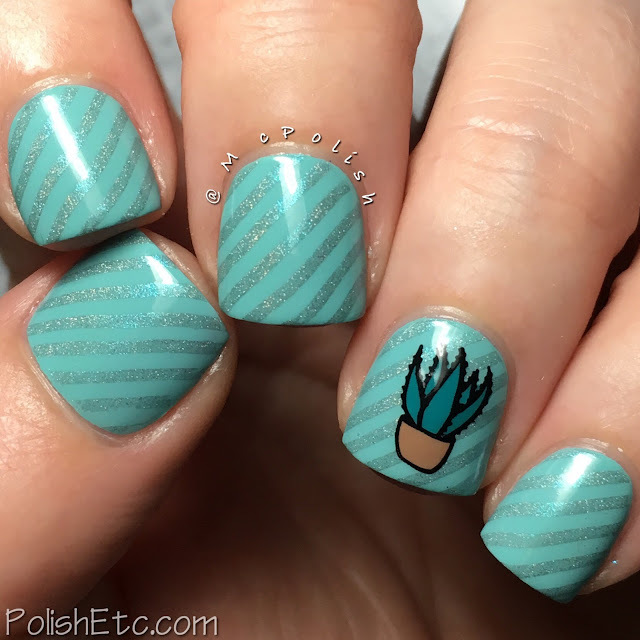 Next, I used OPI's "Fly" and Zoya's "Flynn" to color in a little potted succulent stamp from the UberChic Succulents plate and popped that on the ring finger. Everything is topped with a glossy top coat. Again, another simple mani with multiple components. These single image coloring in stamps are the perfect beginners step to advanced/reverse stamping. You must give it a try! 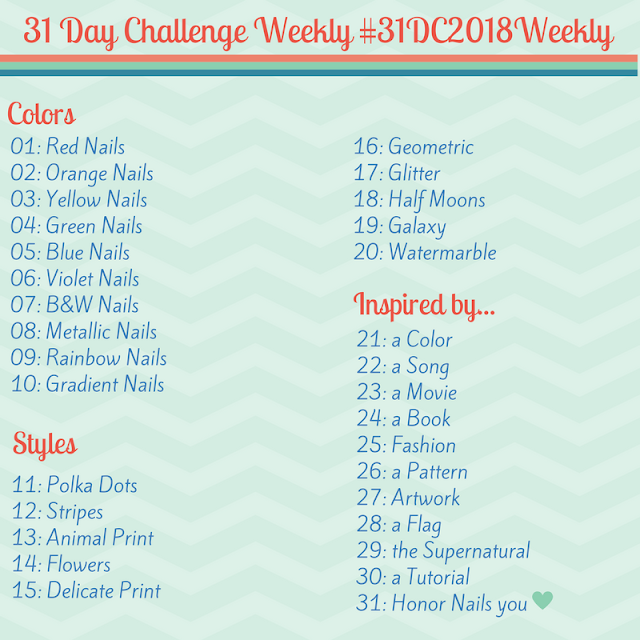 Keep up with everyone else doing the challenge this year by checking out the tag #31DC2018Weekly on Instagram, Facebook and Twitter. Plus...be sure to check out what my German bestie, Lotte, is creating each week on her blog! I just love love love love your ideas! Next year, I want you to get me a schedule beforehand with better ideas than my lame-o stupid stuff ^^ This is so cute and the stripes are beautiful!